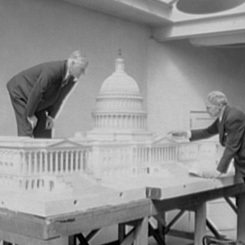 Image courtesy of Library of Congress The model of the Capitol was constructed in 1903 in an attic room in the Capitol. The model is more than 12 feet long and more than five feet wide. On this date, a model of the Capitol, designed to show the building with the East Front extension originally envisioned by architect Thomas U. Walter, was unveiled in the Rotunda. For decades, Congress had ignored reminders that Walter’s plans for a central extension off the east side of the Rotunda were unfulfilled. Architect of the Capitol Elliot Woods estimated the cost of such as extension—which would project the building outward more than 100 feet and create needed rooms for committees—at $2.3 million. Woods had a powerful ally in Speaker of the House Joe Cannon of Illinois. In February 1903, Speaker Cannon declared on the House Floor his support for appropriating funds for an extension, noting that in his youth the building had reached “substantial completion—not full completion” and that despite its architectural grandeur the time had arrived “for the completion of this Capitol.” Moreover, the project fit the national temperament which, as architectural historian Bill Allen has written, was “hospitable to ambitious civic improvements that would tout America’s growing wealth, power, and self-confidence.” The House was more cautious than Cannon, but appropriated $7,000 for studies and a model. Woods worked with the architectural firm Carrère & Hastings to develop plans. In the summer of 1903, French artist Emile Garet and a small staff toiled on the top floor of the Capitol to complete the plaster model. When the model was unveiled the following spring, the Washington Post described it as “much admired as an excellent specimen of artistic workmanship.” The following month Congress established a commission to consider the plans, but the East Front extension was not initiated until 1958 and completed in 1962. Today, the plaster Capitol model resides in the basement rotunda of the Cannon House Office Building.